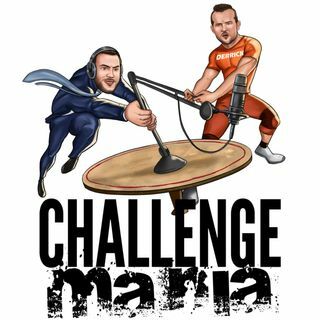 Derrick Kosinski & Scott Yager celebrate Challenge Mania's One Year Anniversary with multiple guests! In this special episode, we talk about the Final Reckoning reunion, and Derrick (@DerrickMTV) and Scott (@SHOTOFYAGER) are joined by the people who make this show ... See More possible, YOU GUYS! For the first time ever, instead of reading listener questions, we brought as many listeners on as possible to be a part of the show, to thank them, and to answer their questions directly. We also talk to our brilliant artist Craig Marier (@Pan14) to learn about his process and talk about the first year of this wild ride that is sure to continue with all of you Maniacs! Fitting that our One Year Anniversary podcast is our longest ever, so strap yourselves in and get ready for THREE PLUS HOURS of Challenge Mania! If 3 Hours isn't enough, we'll have even more reunion coverage up at the Patreon site later this week. Brooklinen is hooking you guys up with $20 off AND Free Shipping. Just use the code MANIA and get THE best sheets ever. Trust us, we love them. Lastly, for sound financial advice, head over to OnYourOwn.Org/ChallengeMania - Make informed money decisions the right way! Thank you everyone for getting us to the One Year Mark. Over 3 Million Downloads later. We cannot thank each and every one of you enough. If you've ever listened to one episode of Challenge Mania, written a review, told a friend, bought a shirt, come to a live show or even clicked on something we've posted ever, even once, on any platform...we thank you, truly, from the bottom of our hearts!